There is no doubt that digital marketing or online marketing is crucial when it comes to the success of any business no matter what industry you are in. Unlike the past where businesses used traditional advertising, today, they are not as effective as online advertising and this has pushed many businesses to adopt online advertising to reach customers. Online marketing is the way to go if you want to reach and create a connection with customers. Gone are the days when it was difficult to understand what customers need. Today, with the increase in tools such as analytics and digital marketing software, it is easier to guess customer’s behavior. Online marketing has enabled businesses to gain treasured insights to customers. When implemented in the right way, digital marketing will enable your business to target and reach its customers, classify new ones, increase sales, and experience lasting growth. These digital marketing approaches will make your business visible to your existing customers online and connect you with new ones. Before we share the tricks, we let you know what is digital marketing especially if this term is fresh for you. Digital marketing is the use of the internet and electronic devices to make your business known to your existing and new customers both locally and internationally. It is a means of advertising done through digital platforms like social media, email, mobile apps, websites and search engines. It today’s digital world, marketing is about connecting with your prospective customers in the right place and at the desired time, selling them with goods and service they need at the right time. This means that you need to target them where they spend most of their time and in this case, it is the internet. Digital marketing encompasses a range of marketing activities such as content marketing, email marketing, search engine optimization, mobile marketing and more. That being said, below, we’ve compiled a list of the digital marketing tricks used by all the famous business brands in the world. Being seen online is the key to success for every business, especially in today’s world where almost all businesses have gone digital. It is one of the ways to stand out from the crowd. For this reason, you need to build your online presence on social media networks of relevance. Note that there are plenty of social networks available but you need to identify where your customers spend most of their time and target them there. Pick those that are relevant to your business and prospects and build your online presence there. “When it comes to digital marketing, content is everything”, says Dixon Wray a content creator at essaygeeks.co.uk writing service. Content can be audio, video or text but when you decide to use one or all of these digital content, ensure it is good and original. If you can’t create unique, compelling and good content by yourself, you can hire an expert to create content for your website and social media platforms. This is where you will need a powerful content marketing plan like never before. To stand out from the crowd when it comes to digital marketing, you need to be visible on all digital platforms. Even though you must create good and original content, it might not make a huge impact on customers if they can only view it on a desktop. So, ensure your content can be accessed both on a desktop and mobile devices. It’s not about publishing content and leaving it there, it’s about publishing and promoting. You need to bring your content close to the right audience as they are likely to share it with their networks and become your customers. To ensure your content is mobile friendly, your website and social media networks are accessible on desktops and mobile devices. Customers are currently using smartphones and tablets to access the web. So, it is crucial to make your website and content accessible to users on all screen sizes. Digital marketing is an amalgamation of different strategies aimed at a plethora of channels, like SEO, PPC, social media, and so on. In order to ensure that you have an integrated marketing mix, you need the right digital marketing tools to help you run effective campaigns. You also need to develop expertise in using them and applying the insights in the right context. Digital marketing is constantly updating. New trends are coming up and going every day. You need to feed your customers and prospects with new and fresh information every day. This is also crucial when it comes to SEO. Note that Google has been updating its algorithms constantly and this seems to be a continuing process. For this reason, it is good to move with the latest tides so that your business can stay visible online to reach your target customers regardless of whether Google updates its algorithms or not. As many businesses go online, competition continues to get tougher. Everything you do online has a huge competition. If it’s SEO many businesses are doing it. If it’s posting good and original content, many are doing it. So, to beat them, you need to publish better and more content. However, it’s not about quantity, but quality. This should be done from the beginning of your business. If you are on the startup phase, you need to make an email list when planning. Ensure to gather people’s emails where you will be sending them any updates and progress of your business. Send them useful information but avoid spamming them. People love infographics because they are attractive. Note that our brains can process pictures must quicker than text. A picture is worth a thousand words, and people will share them more often than texts. Digital marketing is a must for your business success, and we hope our list of tricks will keep you headed in the right direction. These tricks are tried and tested and when you implement them effectively, you can get ahead of your competition. If you want your business to succeed online in today’s digital world, then these digital marketing tricks will come in handy. What tips would you add to this list? Tell us in the comments below! 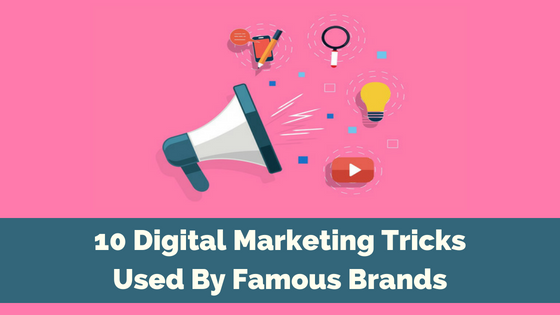 The post 10 Digital Marketing Tricks Used By Famous Business Brands appeared first on B Squared Media – Social Media Management. I love this perspective on digital marketing tricks. I’ve been on a number of your contents on your site and I find them really insightful. Had to subscribe ASAP so as not to miss any entry. Thanks. Thanks so much for the feedback! So grateful that you want to continue to follow the blog. Content Doesn’t Win. Optimized Content Wins….Thanks for sharing your pearls of wisdom.